-Dysphagia (difficulty, discomfort or pain upon swallowing). -Mouth pain/irritation (raw gums and sore throat). -Demineralized enamel…initially the signs of erosion is chalkiness (loss of brightness) and loss of lustre. -Advanced erosion of enamel. The teeth appear with shiny surfaces, roundedness, and ‘cupping’ on the occlusal (chewing) surfaces, much like the image above. They also have a discoloured and yellowish appearance. -An increase in dentinal hypersensitivity. -An increased susceptibility to decay. -An increased rate of wear of the teeth. These can both lead to an increase in the need for fillings and crowns which can become quite costly. For more information on dental crowns, please see the three part series “A Dental Cap? A Dental Crown? Either way, it’s All Good,” posted on August, 2nd, 3rd and 10th of 2012. If a tooth cannot be saved due to extensive damage, it will need to be extracted…Then one has to think about replacing the tooth i.e. dental implants. It may be helpful to read the blog, “Dental Implants…A Great Solution for a Missing Tooth,” posted on October 9th, 2011. Do people even know what enamel erosion is? There is a need to educate patients about enamel erosion. 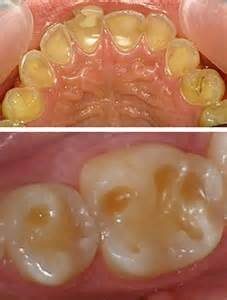 As discussed in the last blog, erosion ‘lesions’ occur when enamel and then dentin, are chemically etched away by the acids of the stomach (GERD)…..again, see the image above. Actual dental caries (cavities) differ from an erosion lesion, in that the tooth loss is caused directly by bacteria, not acids. For more information about dental erosion, please see the blog “Dental Erosion and How to Treat it,” posted on September 2nd, 2013. In this blog we saw the effects that stomach acids can have on your teeth and oral cavity. In the next blog we will look at other contributing factors that cause erosion of the teeth i.e. diet, salivary flow and exercise…until then.